House M.D. places you in smack in the middle of all the drama and smart dialogue fans love from the popular TV show. Play as the surly Dr. House and the skilled staff at Princeton-Plainsboro Hospital, as you race to unravel 5 all-new medical mysteries. Your job is to diagnose unknown illnesses by interviewing and examining patients, analyzing lab tests and even performing surgery! 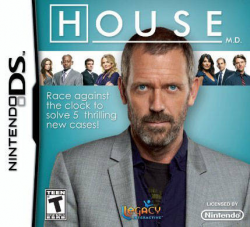 With over 100 varieties of mind-bending puzzles and mini-games, House M.D. guarantees to entertain even the snarkiest player for hours.